On Monday we had our first elopement wedding of the season and what a fab wedding to kickstart the winter wedding season. Pinks, purples & peaches, chocolate delights, woodland adventures, and gorgeous dresses… It’s all happening at Ever After! Leanne wore a stunning ivory chiffon number, with beautiful shoulder & back detail. I loved the relaxed look she was going for, and it worked perfectly with her flowers (which we’ll explore next). And it wasn’t just Leanne’s dress which stole the show… Their super-cute daughter had the most wonderful box-pleated skirt with a large purple, pink & blue flower pattern. Amanda is at it again, and created some wonderful flowers for the first elopement. As always, I can’t wait to see what the rest are like! 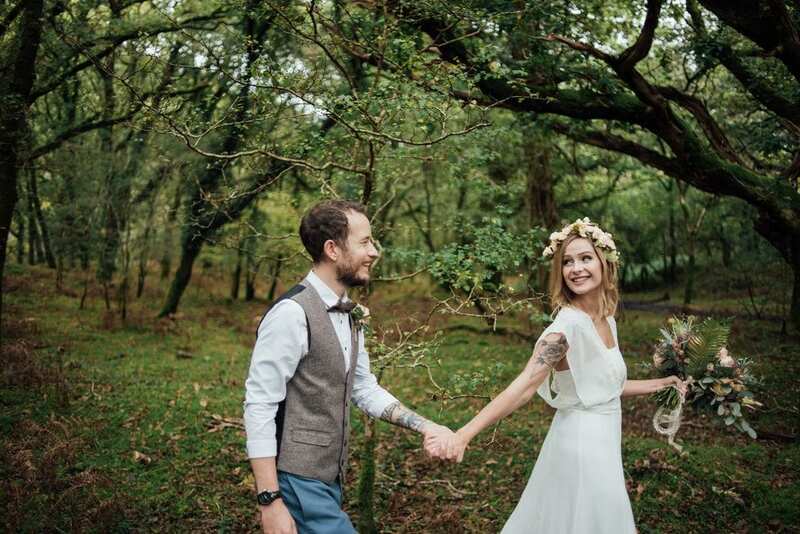 Leanne’s dress had a relaxed and rustic feel, and the bouquet matched her style perfectly. The soft pinks & peaches of the flowers complimented the simplistic wedding dress, whilst still adding that all-important pop of colour, and the wild foliage finished the bouquet off perfectly, enhancing the rustic theme. Plus, check out that flower crown! Leanne & Sam were quite relaxed about the styling for their wedding, so we picked out elements from the flowers and styled the wedding breakfast table accordingly. Green tablecloths were a must to tie-in with the foliage, and we selected purple napkins which were a perfect colour-match to the deep purple flowers in Leanne’s bouquet. For glassware, we went with silver water glasses in addition to the clear crystal wine glasses and champagne flutes. Any vibrant colour in the glasses would have clashed with the table set-up, but at the same time a third clear crystal glasses wouldn’t have had the same edge as the silver added some depth to the overall look. And to finish the look, we added a selection of bark and rose-gold tea light holders, along with some green & purple ones (brilliantly matching the rest of the table!). We also chose a bark bouquet holder for the centrepiece. A scrumptious chocolate number, with peach flowers and a silver cake stand. Super cute, and we assume super yummy (didn’t quite manage to sneak a slice…). Couples have a huge amount of space to roam around in here, and Leanne & Sam decided to book their photographer for an additional hour to allow time to venture off into the woods. Fantastic idea as their woodland photos are fab. So that’s it for the first elopement of the season. Keep your eyes peeled for more elopements as the season unravels… And check out our throwback thursday post for one of last year’s weddings!